“Out of Step” is the compelling, emotional and, at times, unexpectedly humorous account of a military investigation that occurred at a Navy training ground in 1965. During that summer, the Office of Naval Intelligence launched a major inquiry into reports of suspected homosexuality amongst a group of young, spirited, naïve WAVES stationed at the U.S. Naval Training Center, Bainbridge, Maryland. The Navy referred to the inquest using the code name “The Family”. The investigation included daily interrogations and a witch hunt against the women under investigation, their friends and other WAVES whose own careers were threatened. At the time, this investigation comprised the largest number of WAVES at the same base to be simultaneously discharged. At the conclusion of the extensive and terrifying probe, while no attorneys were assigned to represent the defendants and nothing was ever proven, five WAVES were discharged. The incident had life-long ramifications for the young women. Now, 45 years later, journalist Jane “Lee” Watton, one of the discharged WAVES, tells the poignant true story of that summer of 1965 with its forbidden desires and lessons learned the hard way—coming full circle with an emotional reunion for the former WAVES which provided some surprising revelations. With a foreward by Grethe Cammermeyer of “Serving in Silence” fame, “Out of Step” is available on Amazon in both paperback and Kindle e-book formats. Posted June 23rd, 2012 & filed under News. 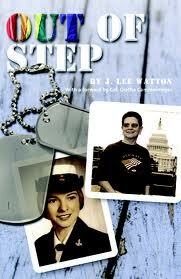 Appreciate Lesbian.com for bringing attention to my memoir, Out of Step. You rock! For those who choose to read the story, I hope you enjoy the journey.